UPDATE: PepsiCo has ceased their fetal cell research and recently adopted this policy: "PepsiCo does not conduct or fund research that utilizes any human tissue or cell lines derived from embryos or fetuses." 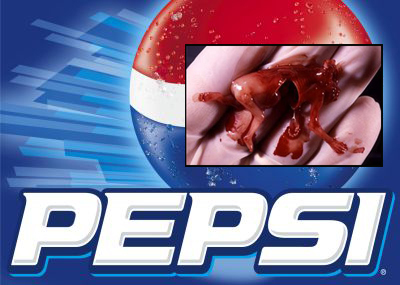 Further, Pepsi VP of Global Public Policy, Paul Boykas, wrote that, "Senomyx will not use HEK cells or any other tissues or cell lines derived from human embryos or fetuses for research performed on behalf of PepsiCo." American Right To Life was honored to work with the boycott organizer Debi Vinnedge. "We are absolutely thrilled with PepsiCo’s decision,” stated Vinnedge, director of Florida-based Children of God for Life. "They have listened to their customers and have made both a wise and profound statement of corporate integrity that deserves the utmost respect, admiration and support of the public." ARTL thanks Debi Vinnedge and our Vice President Jefferson George agreed: "American Right To Life appreciates PepsiCo for their policy prohibiting the use of tissue from unborn children." George added, "PepsiCo's policy will become a model for responsible corporations. And on a personal note, I'm glad I can begin buying Tropicana Orange Juice, that was always my favorite!" April 30, 2012. Pepsi Boycott Begins: Neither Coca Cola nor Campbell's Soups should ever have entered into such grotesque research, but both companies have since done the right thing by ending their partnership with Senomyx' food research on an aborted baby's cells. However, as announced on Denver radio, vice president Leslie Hanks, on behalf of the nation's first right-to-life group, has committed Colorado Right To Life to join Debi Vinnedge's call for a boycott of all Pepsi beverages including: Pepsi & Diet Pepsi, Mountain Dew, Sierra Mist, Gatorade, Propel, Tropicana Orange Juice, Bottled Lipton ice teas, Bottled Starbucks Frappucinos, and Aquafina Water. On this Denver radio show, hear also Vinndedge's horrific explanation of how stem-cell researchers harvest organs from babies even while the babies are still alive. And if possible, please DONATE TODAY!